The Ink Trap: A Bombshell Birthday Celebration! Today I am happy and honored to be a participant in a very special celebration! Welcome to the first annual "Happy Birthday Shannon Blog Hop"! Shannon is the owner/creator/artist extraordinaire of Bombshell Stamps. 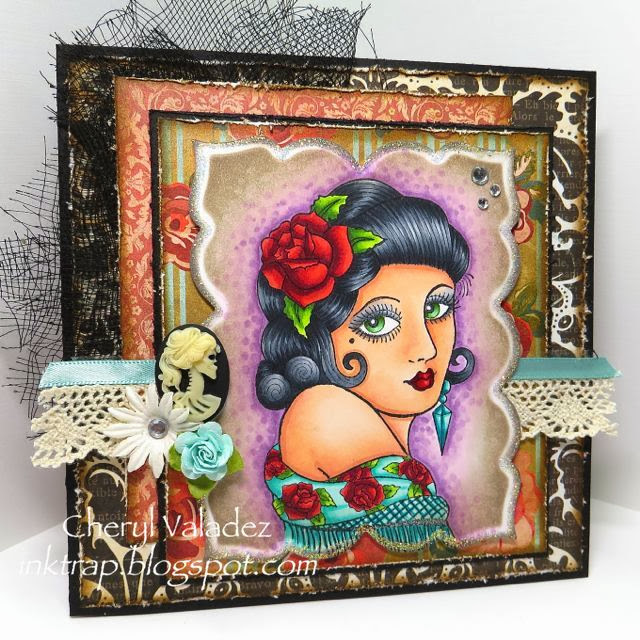 Bombshell Stamps was my very first design team when I started blogging and I was and still am completely enchanted with their fabulous collection of images consisting of classic pin ups, Dia de los Muertos, and tattoo inspired art. Absolutely wonderful stuff! Please, please, please check out their site here. You will love them! By the way, they have an awesome blog, too! I was truly torn on which image to use, because I LOVE them all, but because Shannon's birthday runs right next to Dia de los Muertos I opted for Rose's Portrait. She is a real Latin beauty and I think she works well for a Day of the Dead theme. After finishing this card I came to one conclusion, I MUST use my Bombshell Stamps more often! There are LOTS of lovely and talented folks participating in today's hop. You will be awed by their amazing creations. Just go through the list and prepared to be wowed! OMG just stunning! I really love this!! Great card and amazing coloring as always. love the purple around her! These layers are outta this world crazy good. i need to learn how to do skin tones like you! Gasp!!! You truly are the coloring queen! I am laughing as I have that same pendent you added sitting next to me on my desk looking for a home! This card is drop-dead gorgeous! Amazing job coloring Rose's Portrait. I especially love her eyes and the glow to her skin. Wonderful design with so many fabulous details. Thanks so much for hopping along with us on this special occasion! Very awesome indeed!! I want to color like you when I grow up!!! LOVE LOVE LOVE!!! Wow, stunning card and thanks sooooo much for the sweet bday wishes! I always love what you create and this card is no exception! Amazing! Beautiful papers and image, along with all the elements! Beautiful! I need that stamp for sure. Hello Miss Cheryl, well Alaine almost said it all you are the COLORING/LAYOUT QUEEN, this is truly one of your finest makes,, making it with love, makes all the difference, thanks for sharing all those wonderful card makers, they are all new to me.. Absolutely stunningly gorgeous card!!! I *LOVE* your coloring of Rose and the purple around her. Great textures, distressing and cameo too!